This watershed book takes us behind the picture-postcard views and into the landscape, where we can understand, appreciate, and enjoy the natural history of the spectacular Santa Catalina Mountains. Its vividly illustrated chapters and nine picture guides (featuring native flora and fauna) paint a rich portrait of this famous range. In clear, everyday language the authors explain just what the Sky Islands are, telling the story of when and how they came to be — their deep geologic and biotic history. They also describe ten stops along the Mt. Lemmon Highway where visitors can easily see and understand the eight major biomes found in this range. Hundreds of photos, a dozen maps and figures, and more than two dozen stand-alone profiles highlight special places, people, or elements of the Catalinas and Sky Island Region. If you've ever thought "What are those rocks and trees?" or wondered about which animals you might see in the distinctive habitats at successive elevations, what that strange many-bladed plant might be, or where the trails lead, this is the book for you. If you're curious about who or what has shaped life on the slopes of the Catalinas, this is the book for you. A Natural History of the Santa Catalinas is a one-stop, in-depth resource, organized to allow inquiry at many levels, written for the student of natural history and the curious amateur alike. The book includes a glossary, suggested readings, and lists of the common and notable plants and animals of the Santa Catalina Mountains. The Santa Catalina Mountains are as emblematic in Tucson as the Eiffel Tower is in Paris or Mt. Fuji is in Tokyo. Although Tucsonans look to the range every day, although we depend on it for water, storms, recreation, and scenery, few of us understand the makeup of this great range, its violent background, its role in our history, and the ongoing natural forces that make it an elemental part of our lives. Here, at long last, is a book that opens up this symbol of our lifeblood, that divulges the mountain's secrets for all to understand. Keep it handy in your home, in your car, and in your backpack. Here is an excellent, comprehensive guide to one of the most popular destinations in Arizona. The book features lists, photos, and guides to the common species — but it also focuses on the big picture. 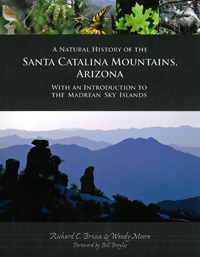 Chapters describe the geological and biological histories of the Santa Catalina Mountains, as well as the global geographic context of sky islands. A new interpretive guide to the Mt. Lemmon Highway includes detailed descriptions of ten recommended stops that can make the 25-mile drive truly an educational event. The authors deliver a lot of science in language that is easily comprehensible to nonscientists. This book provides an amazingly comprehensive (and enjoyable!) guide to the natural world of Tucson's Santa Catalina Mountains and the Southwest Sky Islands. A perfect addition to any family's outdoor-exploration library, it also provides insight into what's at stake for some of our region's ecosystems, plants, and animals as climate change pushes many species up, and even off mountaintops. Read to learn at many levels, read to stoke your inner naturalist, and read to contemplate what we might choose not leave for future generations. Richard C. Brusca is a zoologist, marine biologist, conservation ecologist, and Southwest naturalist. He is Executive Director, Emeritus, of the Arizona-Sonora Desert Museum (ASDM) and a current Research Scientist at ASDM, the University of Arizona, and the Centro de Investigación en Alimentación y Desarrollo (CIAD), Mexico. Rick is the author of 12 books, including the best-selling text on invertebrate zoology Invertebrates (Sinauer) and the popular field guides Common Intertidal Invertebrates of the Gulf of California (UofA Press) and A Seashore Guide to the Northern Gulf of California (ASDM Press). Although he has conducted field expeditions throughout the world, Rick's greatest interests are the Gulf of California and the Sonoran Desert, where he has maintained research programs for more than 40 years. Wendy Moore is Assistant Professor in the Department of Entomology at the University of Arizona, Curator of the University of Arizona Insect Collection, and Research Associate at ASDM and at the California Academy of Sciences in San Francisco. She and her research team use molecular genetic techniques, morphological methods, and phylogenetic frameworks to elucidate ecological roles and key innovations that have affected the evolutionary history of select arthropod groups worldwide. She currently heads two long-term multidisciplinary research projects, one based on the evolution of the carabid beetle subfamily, Paussinae (a fascinating group of ground beetles that have formed obligate relationships with ants), and the Arizona Sky Island Arthropod Project, which investigates patterns of arthropod diversity and distribution in the Sky Island Region.